Third edition: 460 pages (wire bound for easier use). $59, includes shipping in North America. Quantity and educational discounts available. "Thanks for all the hard work on your book. It truly is excellent, and I'm so glad I didn't have to re-invent the wheel!" Ever wondered how to find those pesky entries in your dictionary that defy alphabetical categorization? This is where Fashionable Realtime shines. Do you need a list of every English word that ends in ~istic or ~cle? How about every word that ends in ~y, or words that end with the long-e sound, no matter how they're spelled? There are lists for practically every conceivable affix, combining form, or other stenotypically identifiable feature of English, including words with frequently used medical and scientific affixes. When your dictionary has ghosts that need to be eradicated or fixed, this book can take you right to them. What's more, Fashionable Realtime takes you through the 5,000 most frequent words so that you can spend your time with those most likely to arise based on probability. Fashionable Realtime first deals with unlearning old theory, and it explains in plain language what's needed to get serious about the upgrading task. Based on the learning styles of many reporters who have retooled their theories, it offers a highly sensible framework that avoids confusion and gets you the desired result in the shortest time. 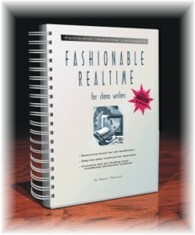 With this book, you're armed to write fashionable realtime to meet the needs of the profession.